On Sunday, Sept. 12, 1971, hundreds of people began marching toward Matthews Beach Park along the shores of Lake Washington north of Sand Point. Families, couples, adults and senior citizens converged on the park in two streams – one from the south, one from the north. They marched there that sunny late-summer afternoon along old railroad tracks, on a route that dated to the 1880s. The “hike-in” and rally was organized by Merrill Hille to draw attention and create support for turning the old railroad tracks to a bike and pedestrian trail. Elected officials and civic leaders spoke to an estimated crowd of 2,000 people, and the event was a turning point in the history of what became the Burke-Gilman Trail. With the route for the final “missing link” to the trail announced last month, it’s worth looking back nearly 50 years at how a group of neighbors helped to create a priceless asset for local commuters, recreational hikers and bikers that also served as inspirationfor other “rails-to-trails” projects around the country. Before the Burke-Gilman Trail was created, Hille lived near Matthews Beach with her husband and children. Like many in their neighborhood, Hille often walked to Matthews Beach with her kids in tow, using the old (but still active) rail line to get there, and crossing the railroad overpass on foot over busy Sand Point Way. “There was no railing, so we made the kids walk between the rails to get there so they wouldn’t fall over the edge,” Hille said. In April 1971, Burlington Northern announced their intention to abandon the little-used route and sell off the property at market value. A few months earlier, Hille and her neighbors had anticipated Burlington Northern’s actions and saw an opportunity. 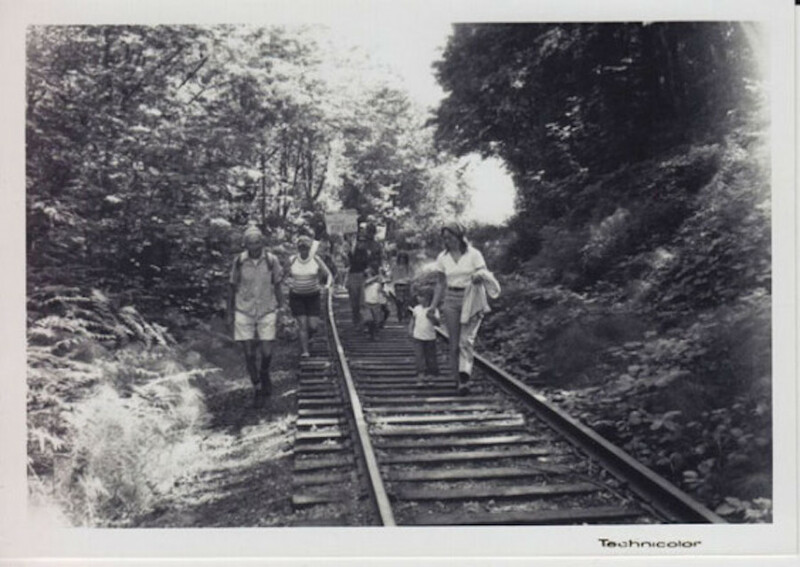 In November 1970, they created a grassroots organization to pursue an alternative to the land being sold off in chunks, and to advocate instead for development of a trail along the old rail line. Though it was old and little-used by 1971, the route had an illustrious history that hearkened back to the earliest decades of Seattle’s rise as a West Coast port. Plans are all well and good, but it took a significant effort on the part of Hille and her neighbors’ Burke-Gilman Trail Park Committee to make the trail more than just a dotted line on a map buried in a report. Hille’s neighbors included Irv and Estell Berteig. Irv Berteig worked as a planner for King County. Other members of the committee included Mamie Rockafeller, Frank McChesney and Jim Todd. They made flyers and courted media coverage for the effort, and reached out via mailings for donations of cash and other support. They also connected with supportive community groups, including the Cascade Bicycle Club. Hille says that in the summer of 1971, the committee leadership arranged a meeting with Seattle Mayor Wes Uhlman. The meeting was scheduled to last just 15 minutes, but instead it stretched to over an hour. Mayor Uhlman liked the idea for the trail, Hille says, but told the group he needed them to generate public support for it. The “hike” was the rally on Sept. 12, 1971. Even though some anti-trail protesters also showed up, the event was a catalyst for much of what followed. Letters of support and petitions in favor of the trail began piling up in the mayor’s mailbox at the Municipal Building. But the path toward making the trail a reality proved to be trickier and more time-consuming than first thought. As the presence of demonstrators at the rally had shown, not everyone along the route wanted pedestrians and bicyclists walking and pedaling through their neighborhoods.